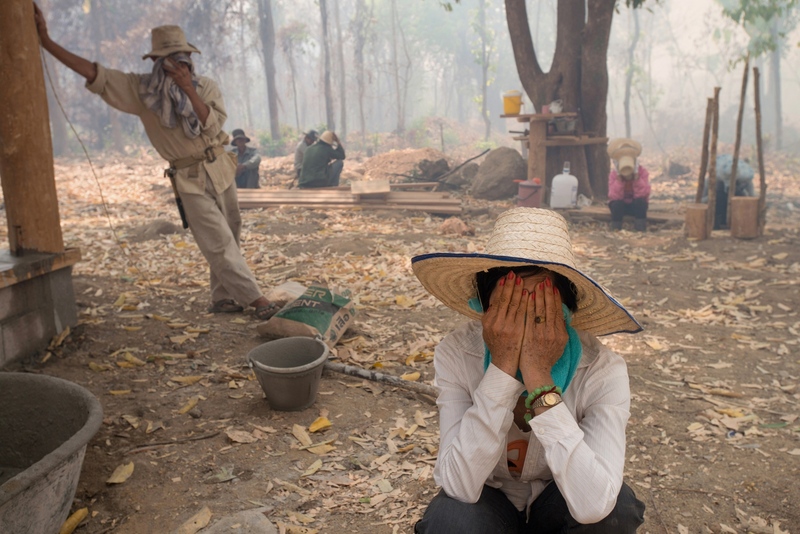 Smoke Crisis in Northern Thailand. 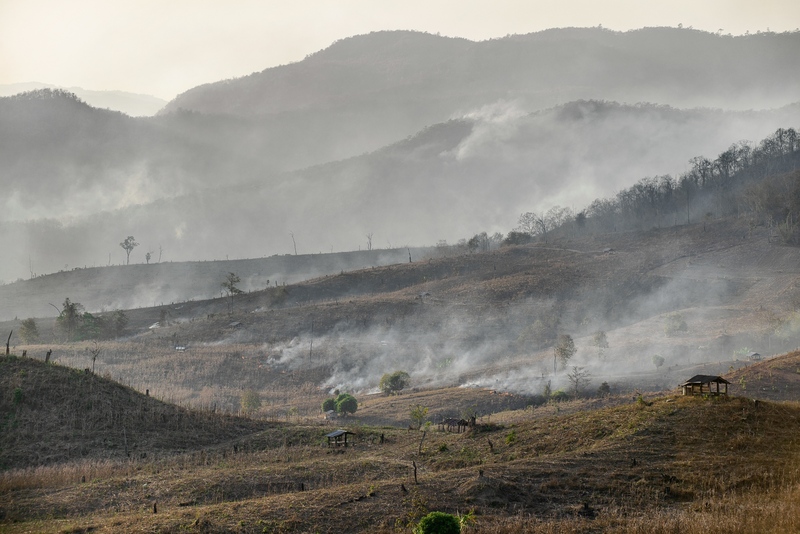 Due to unhealthy pollution, people in Northern Thailand have been facing with smoke crisis every year from the end of February to the end of April for more than a decade. 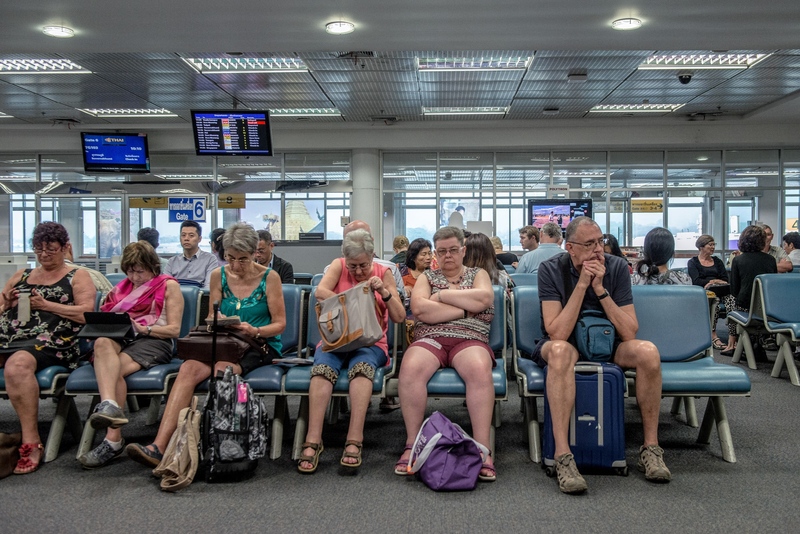 A growing number of people together with changes in climate without a doubt will contribute to aggravating the crisis and the situation is getting worse year by year. 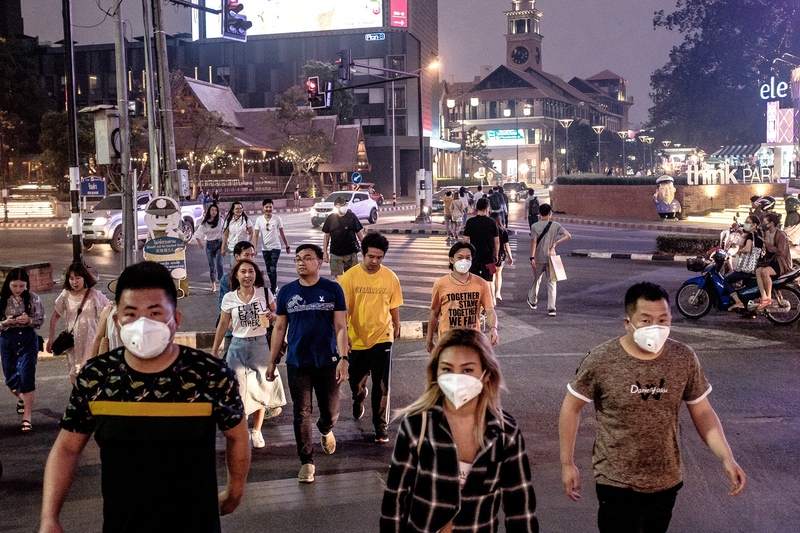 In March 2019, Chiang Mai was struck by its worst ever smoke crisis and has continuously rank number one most polluted city in the world. The information for the Air Quality Index (AQI)from www.airvisual.com on March 30 has raised up to 520 AQI and had been consistently ranked among the top 10 since the end of February. A rise in the air of tiny particles (PM2.5) which are small enough and able to invade deeply into the lungs and create long-term major health risks. Intense and persistent smog falls over streets and houses are invisible from the distance day and night. The geography of Northern Thailand is characterized similarly to the shape of a “bowl pan”. This is because the city of this part of the country is surrounded by mountains. During the change in seasons from winter to summer, those dry days bring smog into the base of the “bowl-pan” terrain below. This meteorological phenomenon is called the inversion of temperature. Man-made forest fires are the major cause of the haze, especially at this time of year. In order to increase the range and stimulate the growth of rare edible and expensive mushroom, many villagers set fire to the forests. 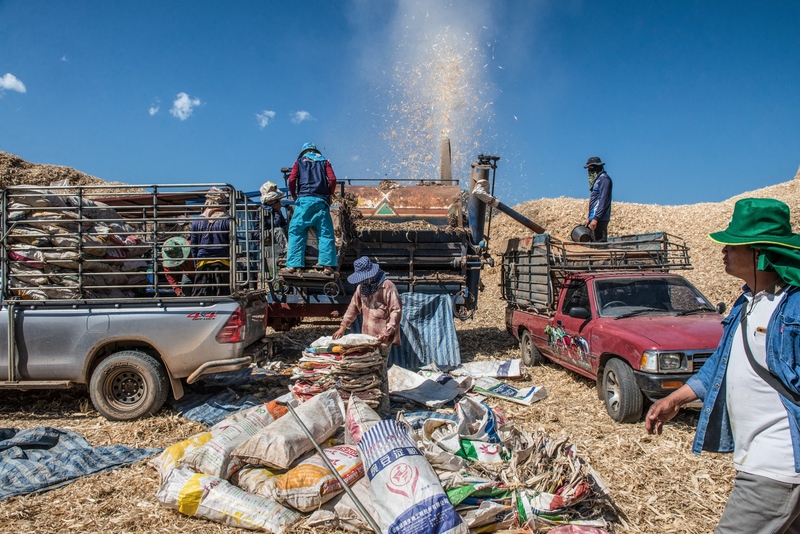 Since many livestock feed companies have been involved in contract farming, the company has their own production and quality control standards at each stage within the production process. In this farming system, a firm and a group of farmers have developed a contract agreeable to both parties so as to undertake a farming enterprise and a company is a monopoly seller of its final product. However, if a crop failure due to climate change, drought, epidemic or whatever happens, the risk will always fall on the farmer and no compensation is often provided. Moreover, farmers in this system traditionally use irresponsible practices of slash and burn agriculture. They burn existing stubble before the cultivation of soil for growing maize. These practices have always caused smog problems and will become unavoidably more and more severe in the near future. 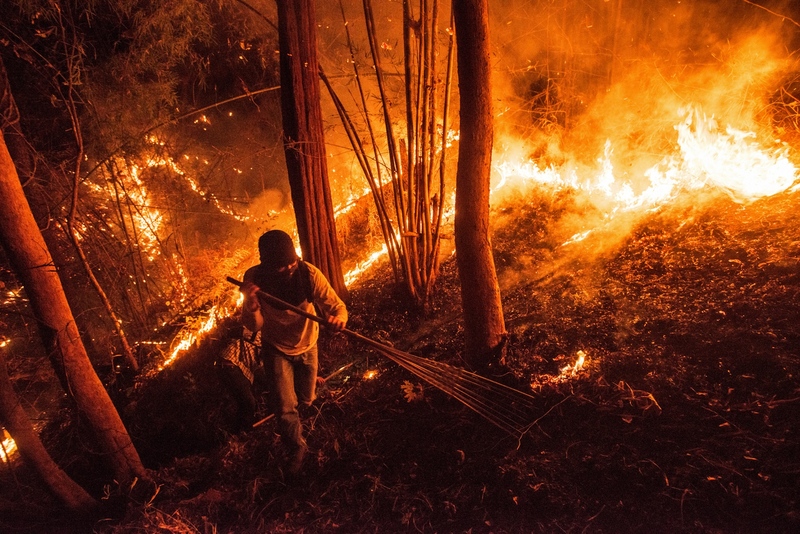 A firefighter hikes through a forest fire to control the spread of fire occurred during the night time by making a firebreak. Most of wildfires (99%) are caused by humans. In the period of the smoggy season in Northern Thailand. Most of the activities that involve with burning are blamed to be the caused of smoke crisis. 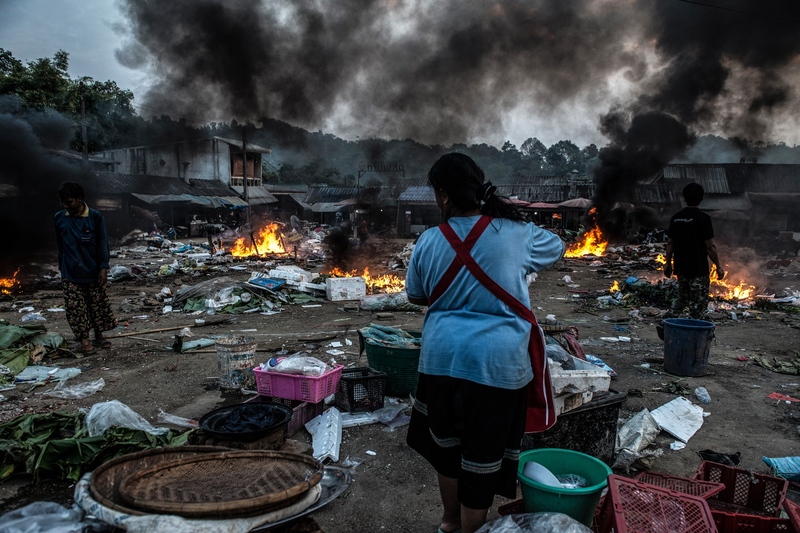 Local villagers in Tak province are burning plastic waste in fresh the market. 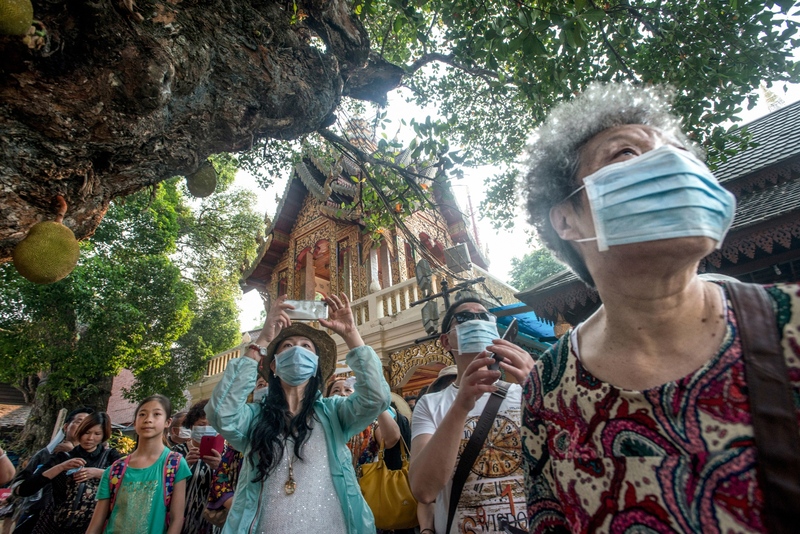 Asian tourists wear dust protection masks during making a visit to tourist destinations in the smog season. Wildfire occurs during the day time in a place outside of the city. The nearby areas where labors working are covered in haze. Chiang Mai sky is covered all over by smoke. Local people and foreigners are all affected by heavy smog. People are walking in the evening across the Rin Kham intersection of Suthep and Nimmanhaemin road, one of those that have economic importance in Chiangmai due to it’s popular for trendy shops, restaurants, cafes, galleries. 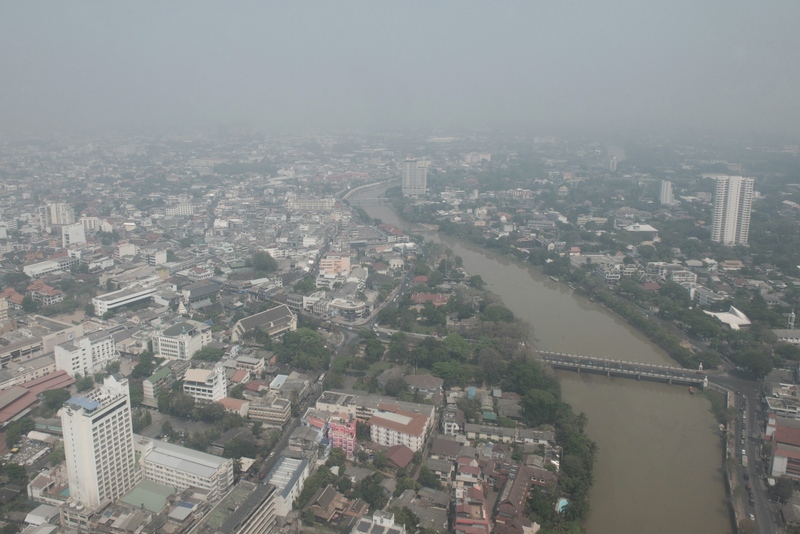 The Smoke crisis in the northern region affects the economy of cities that rely mainly on tourism like Chiang Mai. And there is a tendency to intensify every year. Chiang Mai sky is covered by fine particles of PM2.5 and the quantity of these dispersed fine particles has tremendously surpassed its critical safety limit. PM2.5, the tiny particles can be inhaled into and accumulated in the respiratory system. They are small enough to invade even the smallest airways and can lodge deeply into the lungs. 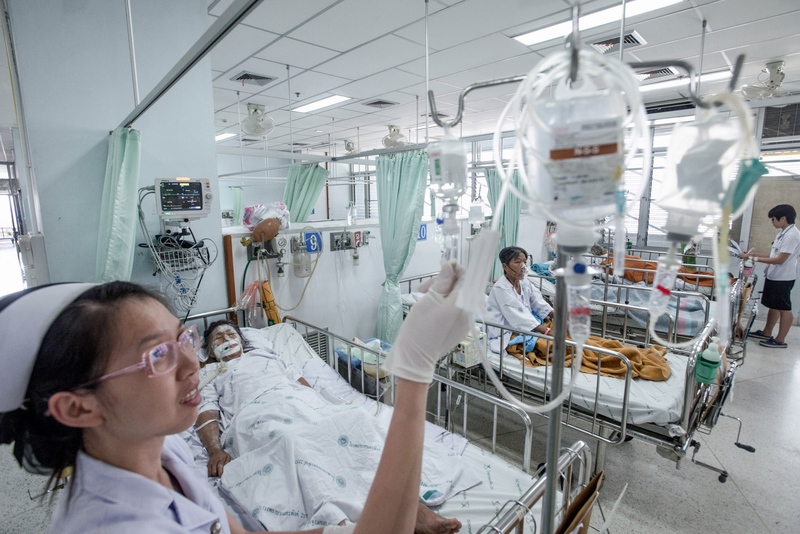 In the smoggy season, hospitals have a significant influx of patients with respiratory problems. Most of them are older people, smokers and people who have problems with immune disorders or difficulty breathing. 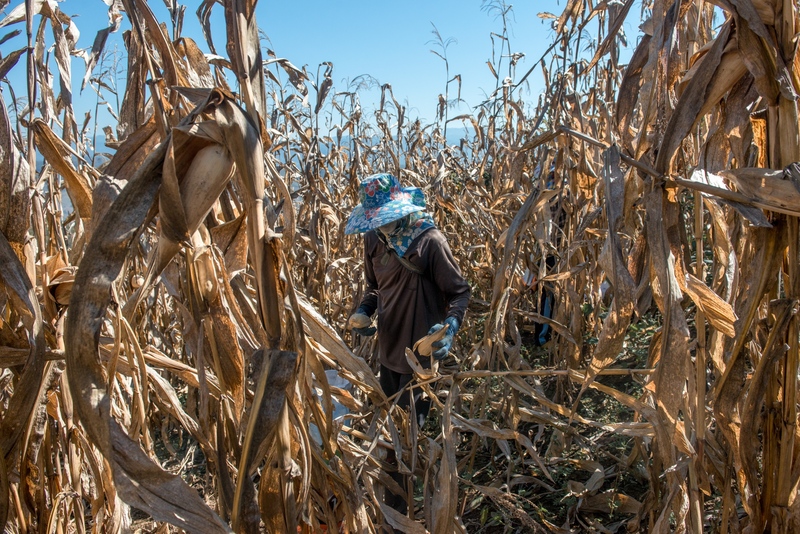 Kids are playing in the corn fields in the mountainous areas of Mae Chaem, Chiangmai, Thailand. The Incomes of their families mainly come from corn used in the animal feed business. Plantation on the slope of mountains predominantly commences from June and the following harvest continues from December towards the end of January. Stubble burning is a common practice widely used for land clearance prior to the forthcoming plantation season. This practice will not only encourage soil deterioration but also a heavy smog and potentially toxic air pollution. Corn is widely grown on mountain slopes. This plant is specially adapted to mountainous regions that are not suitable for other types of plants. A wide use of this monocropping system has led to heavy deforestation. Fire is extensively used for land clearing before plantation so as to make more business income for the company from farmers who engage in contract farming system which will largely contribute to climate change threats. Mae Chaem District, Chiang Mai, Thailand. Farmers are milling corns after harvesting. They are the one who's been blamed for causing air pollution in the city in the smoke crises period in Northern Thailand. Thousands of acres of forest have been dedicated to mono- cropping system. The areas burned by wildfire each year appeared to start after crop harvesting. Stubble burning is a major reason for heavy smog and air pollution. Slow-burning wildfire scorches thousands of acres. Forests are considered to be vital for human life due to their provisions of a diverse range of resources. They are able to store carbon and produce oxygen which is necessary to the existence of life on the planet. 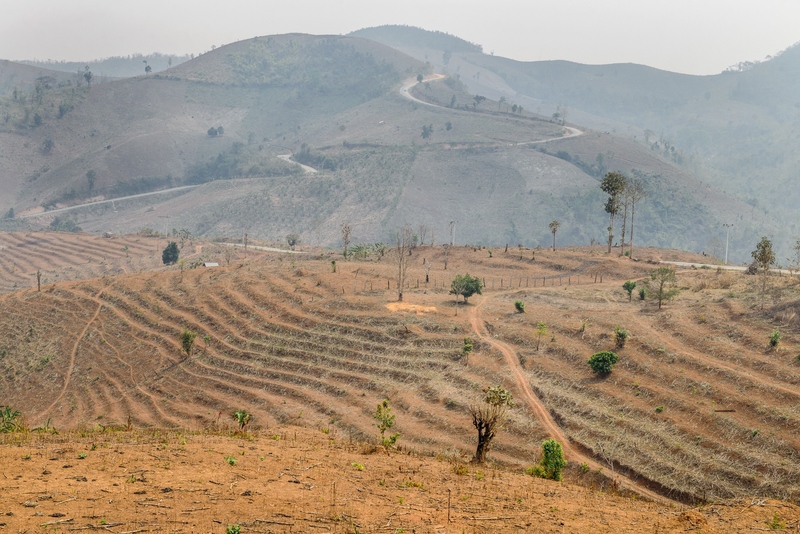 The extensive destruction of forests turns the land into barren areas that can be described as “bald mountains”. 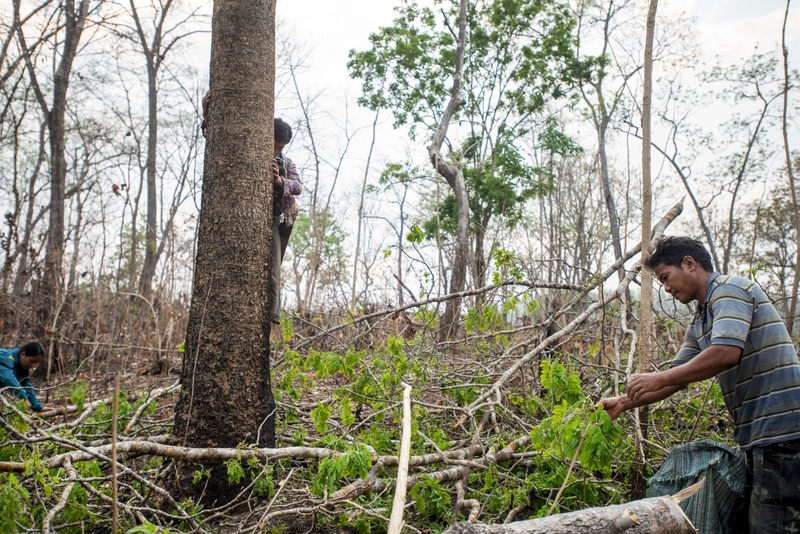 The deforestation is an extraordinary contributor to climate change. City areas are covered in haze. Flights have been scrapped or delayed as misty fog hung over the airport. 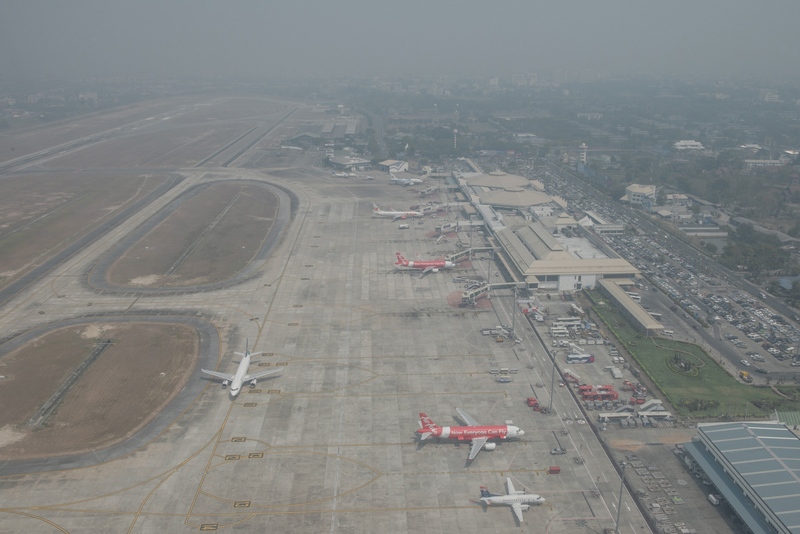 Heavy smoke covers the Chiang Mai sky affected on flights, some tourist’s flights has been delayed and canceled. Chiang Mai, Thailand. In the evening at the view point on top of the Maya shopping mall, usually are able to see the iconic mountain of Doi Suthep. Due to the heavily smoke arises at it’s peak. The mountain disappeared into the smog. Chiang Mai, Thailand. 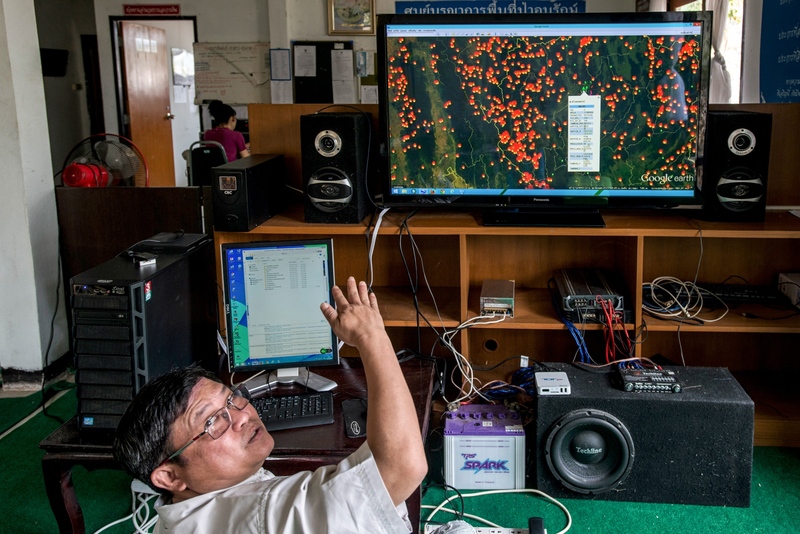 The use of fire monitoring system for the detection and assessment of current bushfires made by satellite sensors. Satellite-based information, Terra/Aqua MODIS, SUOMI NPP and NOAA19 will then be used for the management of fires so as to minimize the subsequent consequences such as health and economic impacts. 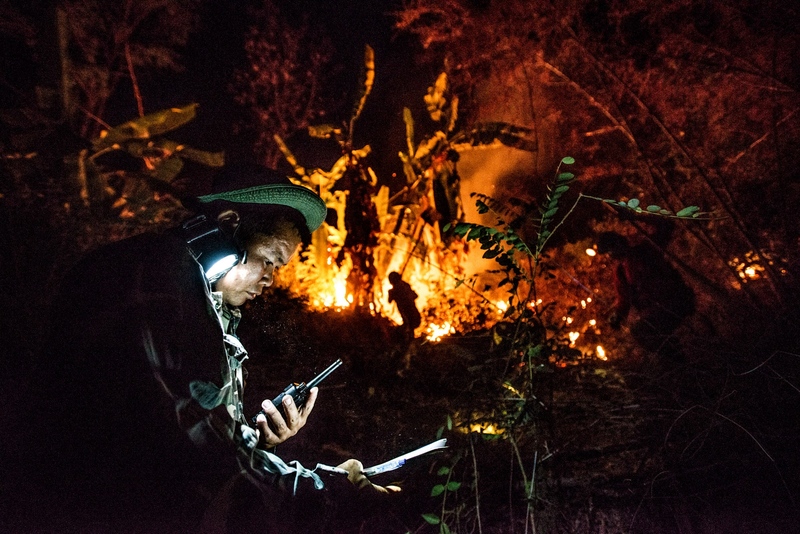 Fire fighters at work battling to put out the forest fires at night which had been reported by villagers. Mae On, Chiang Mai, Thailand. 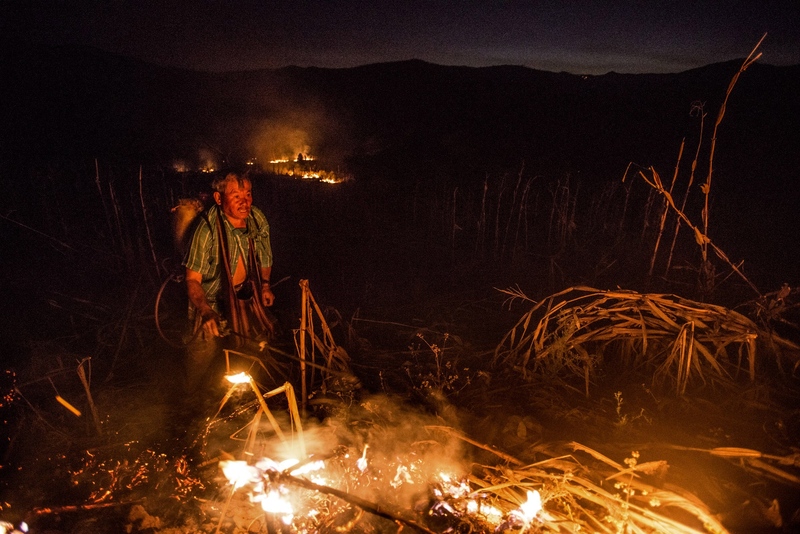 At dawn local farmers rush up into the corn fields on the mountain tries to put out the forest fires that he afraid that can spread into his farm. Mae Chaem, Chiang Mai, Thailand. Aerial firefighting operation. 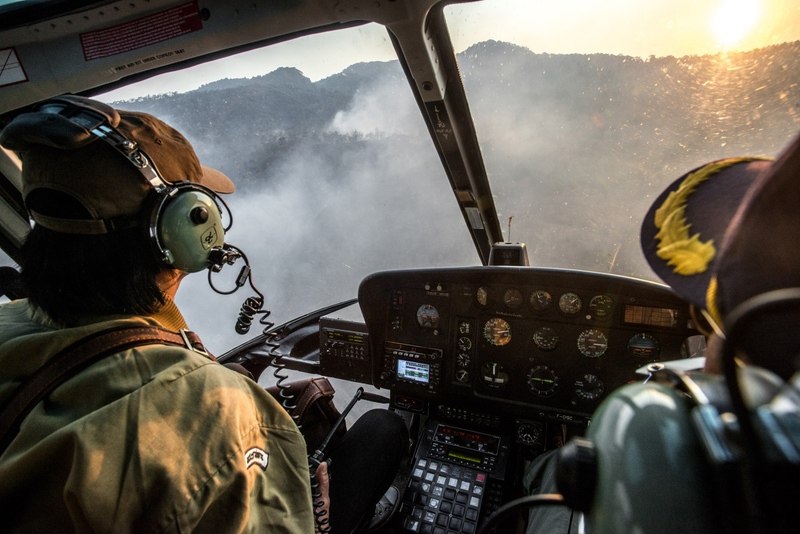 The use of a helicopter to help report forest incidents for fire ground operation. 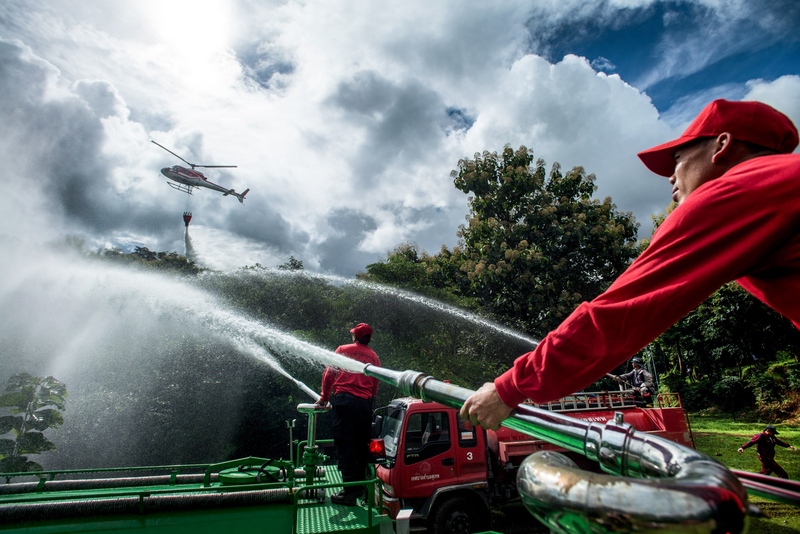 Firefighters demonstrate the capability of handling a wildfire. Farmers have been engaged in contract farming with livestock feed companies who are eager to expand their profits. They have also adopted fire–fallow cultivation with the purpose of increasing their crop yield. 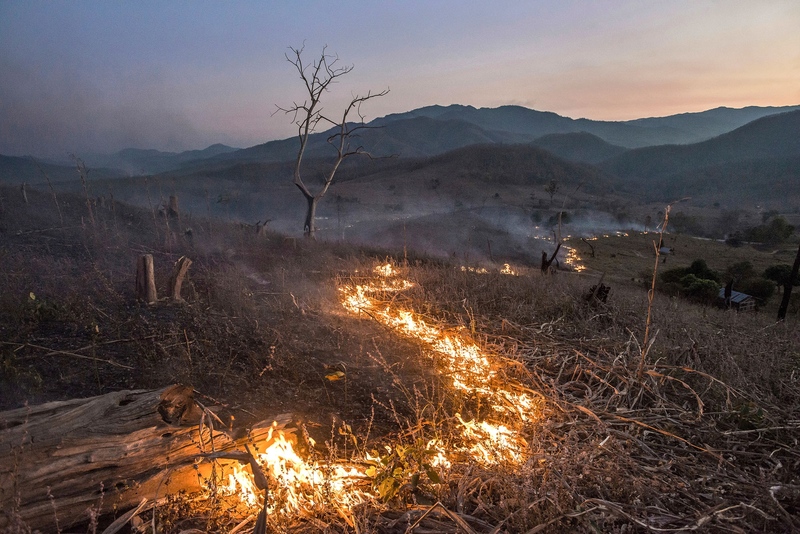 Fire is used as a conventional tool in land clearing management for new crop plantation. 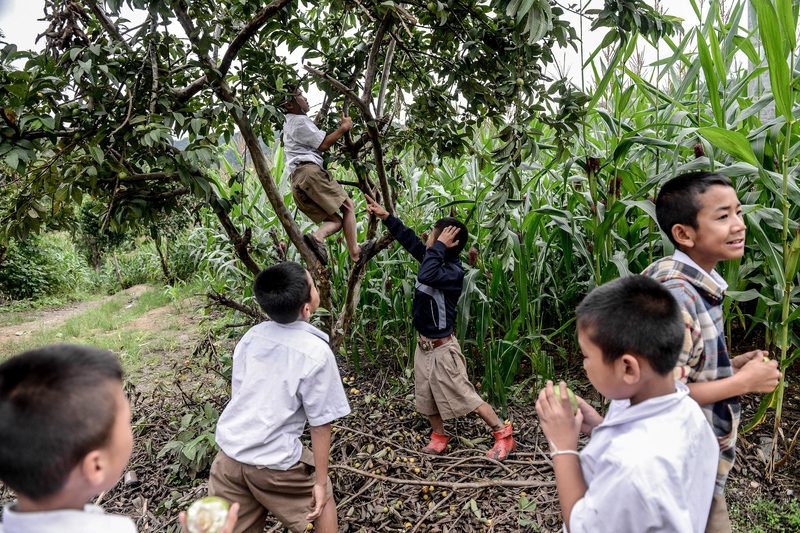 Not only it depletes the soil of nutrition and alters the pH levels from its natural state but also it creates landslides and further illegal deforestation which will be contributed to Climate Change. Moshe, a Lahu hill tribe people who once worked as a firefighter. During a fierce firefighting operation, his hands had suffered burns in a dangerous undertaking that left him disabled. After becoming a person with disability, his life has to only cling to the social welfare system. Many believe that plant species in fire-affected environments require fire to germinate, establish, or to reproduce. Collection of Melientha suavis Pierre, native to Southeast Asia countries, is commonly seen after a vegetation fire and many have also blamed it for primary cause of forest fire and hazy conditions. Wat Tham Pha Plong, a temple in the forest of Chiang Dao which is famous for a strict Dhamma practice and mental cultivation. 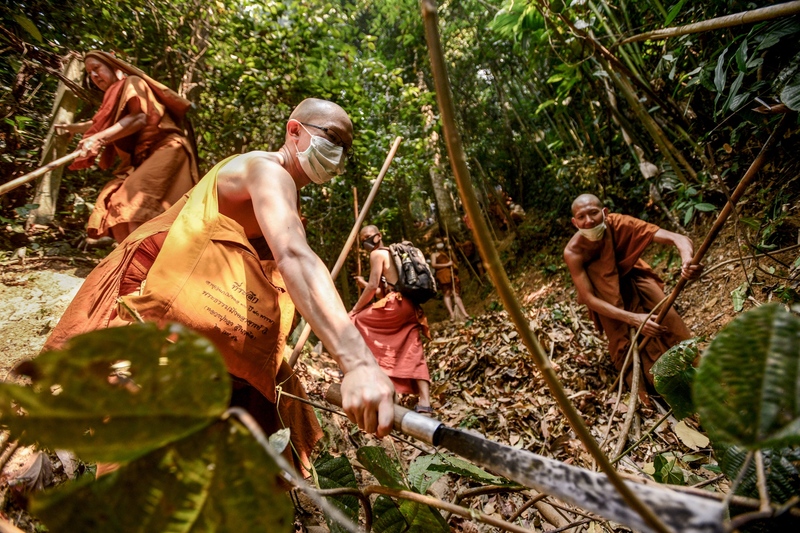 One of the 227 precepts states that it is prohibited to destroy plants but to keep the temple and themselves safe from a wildfire, monks have to rake plant leaves and create a firebreak around the temple. When Ton Maneetor, a senior activist was young, he was shot in his left eye whilst tracking a forest poacher. 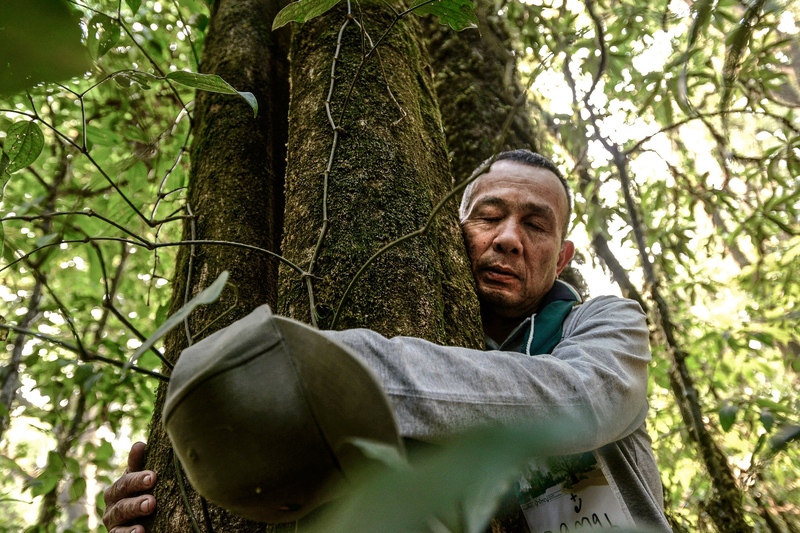 After losing his eye, he realised the multiple sustainable ways of solving problems and protecting the forest from encroachment should initially come from his understanding, knowledge and experience of the local area despite being partially impaired. During a smoggy season. Ton’s children are taught to have a perception of being in harmony with nature and the ideology has been passed down through many generations ensuring consistency throughout. Doi Inthanon, Chiang Mai, Thailand. 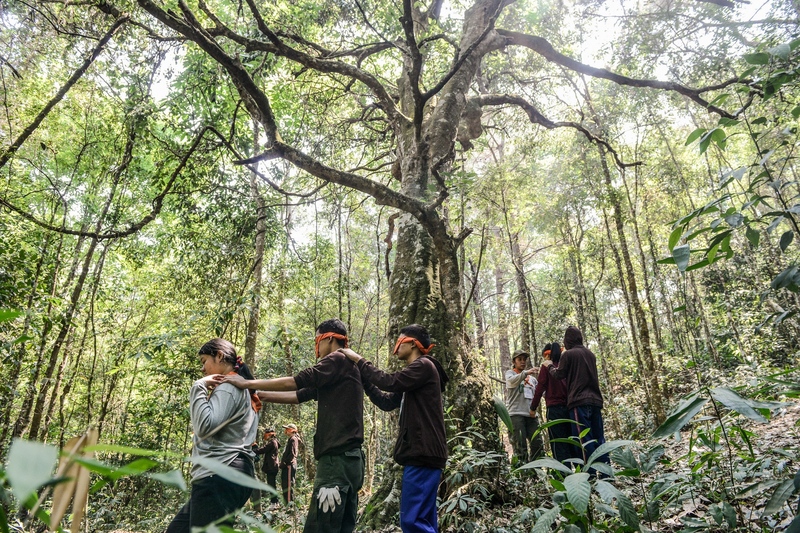 Young people use sensory activities to awaken their own sense of connection with nature. They have been implanted with the sustainable values of environmental savings by a group of environmental activists. 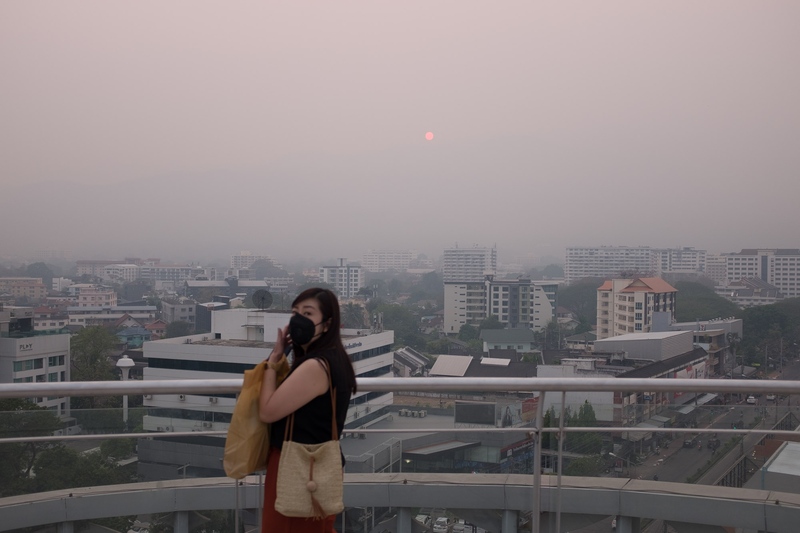 Chiangmai, the city surrounded by mountains is covered in a thick layer of smog during annual wildfire occurrence. 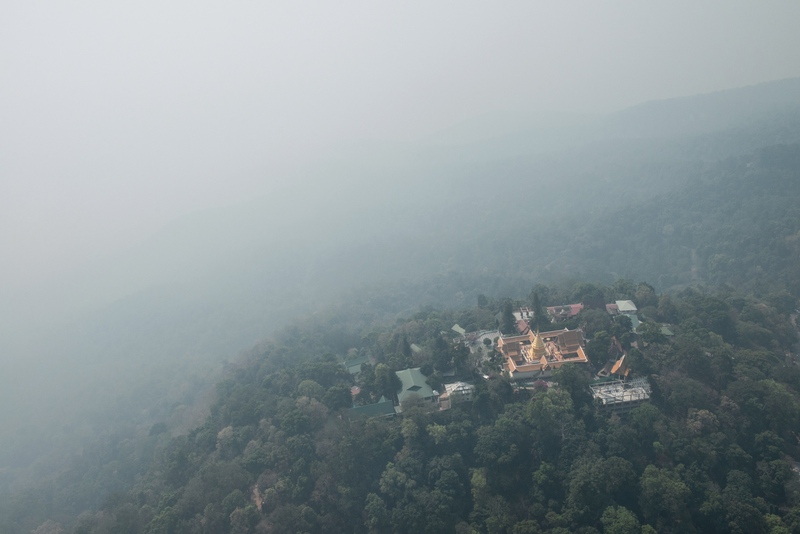 Wat Prathat Doi Suthep in Chiangmai, an iconic temple high up in the mountain is also covered in haze.